A few months ago I finally got around to building my own gaming PC, and one of the main motivating factors was PUBG. I remember the first time I saw a stream of this game and feeling completely giddy and entertained at how simple its main objective was. You’d think after seeing huge game companies releasing tons of shooters over the years, someone would’ve gotten to this sooner. Instead, this idea comes by way of the modding scene… based on a Japanese movie from 2000… based on a novel from 1999. No other game this year has made my heart race the way that PUBG does. Whenever a game comes out and inspires an entire genre, it’s worth taking some time to dive in. Splatoon is probably the only game that does streetwear right. Speaking of innovative takes on a familiar shooter formula, Splatoon 2 gives Nintendo’s family-friendly take on pew-pew-shooty games a second chance after the series’ sad soft opening on the Wii U. So many things contribute to why this game just feels so good. From the motion controls, the slick art style, the fluid frame rate and the way the game lets you move around the map, it’s hard not to get sucked in once you’ve begun to master Splatoon 2. It’s a game that’s fresh in so many ways. I’ll admit that I was skeptical going into this one. A good friend of mine had been recommending the series for ages, so I finally decided to give it a shot. And sheesh, am I glad I did. 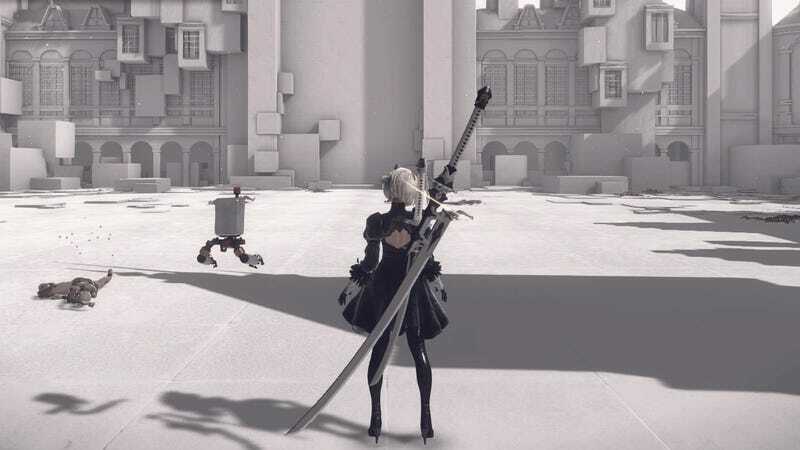 The opening moments of Nier: Automata set the tone in a way that so many other games fail to do. This game laughs while it steps on the gas, leaving you to just give in and enjoy the ride. The incredible soundtrack sure helps too. When I heard that the creators of Torchlight dropped another game, I was intrigued. I loved those games and was always curious to see where they’d go. It wasn’t until our very own Michael Fahey started sharing gifs with the staff that I thought, “Oh yeah, that’s what I’m talking about” and jumped right in. Despite some technical issues, Hob is a joy to exist in and watch unfold in front of your eyes. And sometimes the game just gives you a moment to sit down to take in the sights. It’s a shame that Runic was closed down a while back, but Hob was quite the swan song for the studio. I hope this isn’t the last we see of them though. The Switch has become the mini PC that I throw into my bag; as a commuter in a major city, it’s incredible to have these bite-sized games with me on the go. Golf Story was the first time I had a small indie game that didn’t already exist on other platforms that helped me make my case for the Switch (ya know, outside of one of the best Zelda/games ever created). Golf Story was an instant love for me. An RPG with funny dialogue, catchy music, and compelling golf that takes you to different worlds like prehistoric lands littered with fossils, windy mountains, and sunny beaches. This game caught me all the way off guard. Just play it already. I gotta admit I’m a sucker for the emotional walking simulator, and What Remains of Edith Finch is one that completely took me over one night. It’s a game that stuck with me long after I finished it. The beautiful compilation of the stories of the Finch family and their tragic ends is something that few pieces of pop culture do well: explore death and celebrate life. Edith Finch is also a prime example of something that is its best version mainly because it’s presented in an interactive form. I wouldn’t want to experience this story as a film or a book, and it’s a game that I often recommend to people new to games. It took me two tries to get into Horizon Zero Dawn. I made the mistake of waiting to play it until after playing The Legend of Zelda: Breath of the Wild, which came out just a few days after this one. But after letting that game’s influence on my brain evaporate, revisiting Horizon was worth the second chance. The way Aloy moves around the world and the way that the moonlight spilled through the trees and reflected on the grass while she narrowly survived an encounter with multiple machines were experiences that never failed to make me smile. I can’t wait to see more of this world. I had too much fun with the photo mode in Odyssey. North Face jacket, snapback and Timbs for accuracy. I can never forget the Christmas, as a kid, that I got Super Mario 64 and stayed up all night playing it. I LOVE Mario games. And from the bit that I played at E3, I knew that I was in for something that hit those same highs I remember so fondly as a snot-nosed kid on the living room floor. Odyssey’s simple yet complex moveset is a first-class tour of what makes Nintendo notorious for: boiling something down into its purest form. And then I explored that simplicity until I could squeeze out a thousand moons or so. Super Mario Odyssey is an instant classic. I’m just jealous of all the kids who are getting this for Christmas. The kind of energy we all need in our lives. The Yakuza series is one that I’ve always been intrigued by. When I found out that Yakuza 0 would not only come out in North America but that it would take place before the first game and the other trillion Yakuza releases, it was a no-brainer for me. I took my first trip to Japan at the end of 2016, and Yakuza in many ways let me go back. It feels so old school but it’s also leaning into all of its silliness in ways that had my girlfriend and me laughing hysterically as we played. 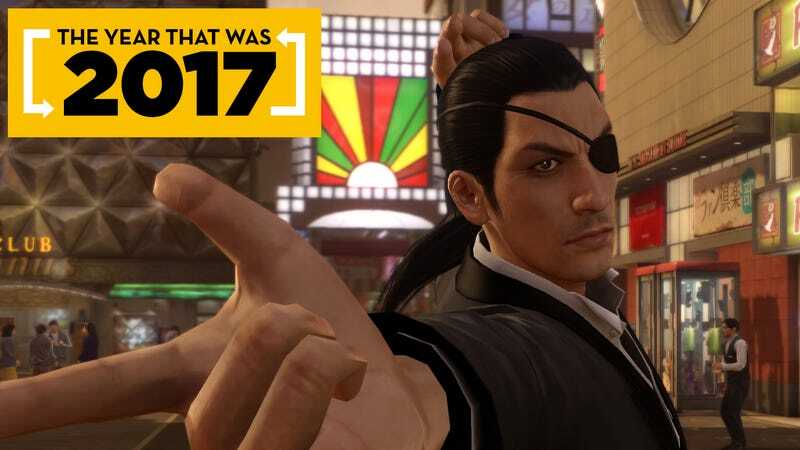 And when we were weren’t playing it, we were sending each other memes and talking to each other like Kiryu and Majima. The cabaret club minigame is worthy of being on this list on its own. SEGA, gimme that standalone game please. Also the winner of the prestigious “This Game Made Me Miss My Subway Stop Numerous Times” award. No game came close, in my opinion, to completely taking over my life the way that this game did. I really can’t remember a game that I completely disappeared into like this one. There was also a special kind of joy that came with discovering the game alongside millions of other players. When I wasn’t playing it, I was talking about it. I loved how Zelda just completely trusts the player to go find their own path. I know for a lot of people that doesn’t work, but for me it just made so much sense. Turning the HUD off and getting smacked around by a couple of Lynels was exhilarating, even more so when I came back with the right gear and knowledge of how the game works. This is an important game that will be dissected and studied for years to come. Honorable mentions: Arms, Mario + Rabbids Kingdom Battle, Steamworld Dig 2, and Gorogoa. Games I need to stop making excuses about and just play already: Resident Evil 7, Pyre, Metroid Samus Returns, Battlechasers Night War, Hellblade: Senua’s Sacrifice. Game that intimidates me but I’ll probably love: Nioh.